REI’s CPM-700 was the standard in RF broadband detection for over 20 years in the TSCM market. Now the ANDRE offers many more features to its users. 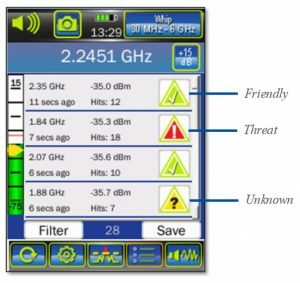 The ANDRE includes robust tools to help identify what type of signals are being encountered and offers powerful post-sweep analysis functions not available in other broadband detectors. The ANDRE automatically generates a list of detected signals that exceed the designated trigger level and register on the frequency counter. These signals display from strongest initial RF level at the top to weakest at the bottom and can be customized to show 10, 25, 50, or 250 signals. Even when the signal list display is full, the ANDRE continues to capture weaker signal information. If a newly-detected signal is stronger than another in the list, the list automatically re-sorts and weaker signals roll off. The ANDRE allows the user to categorize signals as Friendly, Unknown or Threat. By default, signals are designated as Unknown, which is marked as a question mark inside of a yellow triangle. However, every signal can be labeled as Friendly or Threat by tapping the icon. In comparison to the CPM-700, which only displayed RF energy as a bar graph, the ANDRE provides beneficial signal information which helps to identify or inspect specific signals. This information includes the frequency, ambient power level at the time the signal was detected, how much time has elapsed since detection, the number of detections, and the signal type designation. 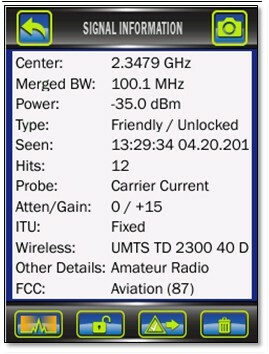 To view even more detail regarding a specific signal, users can view the signal information screen. With the advanced signal data and analysis tools, the ANDRE is expanding the capabilities of RF broadband detectors. REI is offering a one-day ANDRE training course on January 11, 2018 at our headquarters in Cookeville, Tennessee. The course provides a thorough overview of the ANDRE’s functionality and hands-on exercises in dedicated project rooms. If you are interested in reserving your spot, visit the ANDRE training course page.